London - Liverpool manager Brendan Rodgers declared on Thursday that Raheem Sterling will not be leaving the club at the end of the season after talks over a new contract broke down. Sterling, 20, has two years left to run on his contract and is believed to have rejected a new deal worth £100 000 per week -- a significant improvement on his current £35 000-a-week salary. He said in a BBC interview on Wednesday that he would not address his future until the end of the campaign, but Rodgers is confident the England forward will still be at Anfield for the start of the 2015-16 season. "Concentration should be on his football," Rodgers told a press conference on Thursday. "If his ambition is to win trophies, that's aligned with what we do here. 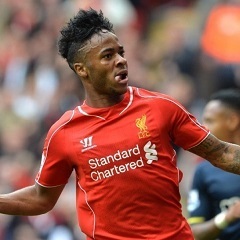 Raheem has two and a half years left on his deal and he's not going anywhere in the summer." Rodgers revealed that the interview with the BBC had not been sanctioned by the club, but echoed Sterling's wish that he will be left alone to concentrate on his football. "There was no permission from us," Rodgers added. "He will learn we all make mistakes in life, especially when you are young. "I think the kid has tried to put off all talk about contract and money. For now hopefully the focus will be on football. "Liverpool are one of the superpowers of football and if the owners don't want to sell, they don't have to." Sterling described reported interest in him from Arsenal -- Liverpool's opponents this weekend -- as "quite flattering", but the London club's manager Arsene Wenger was reluctant to discuss the matter. "Raheem Sterling is a top player, everybody in the country knows that now. He is a very important player for Liverpool of course," Wenger told his weekly press conference on Thursday. "I do not want to speak about any move. We are not in a transfer period; we are in front of a big game. I respect Liverpool and I do not want to go into any supposed move for any of their players."